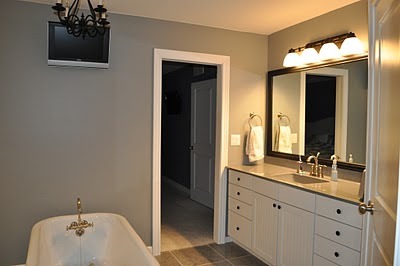 Our master bathroom is finally done! Ike is pretty excited about it. As you may remember, The Tile Shop offered us some free tile. We said "Are you sure?" followed by "Yes, please!". We previously purchased the tile for our kitchen backsplash from The Tile Shop. We love their selection and customer service so we were excited to partner with them! We weren't completely happy with this bathroom since building it. It never felt like us. It never felt fancy like a master bathroom should. It never felt finished. Probably because it wasn't. There were pieces of trim missing, the cabinets weren't finished, etc. Tiling the walls was the extra motivation that we needed to complete this room. Our bathroom is now a great reflection of our style. Which I think we've decided is modern farmhouse. That's a thing, right? We used the 2x12 in Imperial Bianco Gloss tile with charcoal unsanded grout. Nate wanted to install the tiles vertically. I wasn't sure at first. We taped some tiles to the wall to get an idea of how it would look. We both liked it so we went for it. We each have our own sink area which is usually awesome. It's not quite as awesome when you decide to tile the walls behind the sinks. Double the work is never fun. First world problems are hard. This side is mine. I love the amount of cabinets and counter space. This side is Nate's. He gets less counter space because it takes less to make him pretty. (I have to put fluff stuff like this in here because he's still mad grumbling at having to install crown molding. Crown molding that he really likes.) The cabinet tower holds towels and also functions as our medicine cabinet. The area next to towels is our walk-in shower. Another favorite feature of this room. Don't ask Nate about installing crown molding around that shower. It's a touchy subject. But doesn't it look pretty? As a reminder, this is what we started with. We would like to thank The Tile Shop for supplying us with the tile to kick off this project. We would also like to think Pfister for supplying our beautiful faucets. You've made Ike's day! We'll be back Wednesday with tips for drilling into tile! Friday we'll cover how we changed up the hardware. Like this post? Check out our home tour and diy page for more ideas! Who's happy we finally finished this bathroom? Is there anything better than a smiling Ike?